ThinkPad Edge rival. Matte case, matte screen, ExpressCard slot, Intel's Core i5 processor - the TravelMate P453-M53214G50Makk sounds like the perfect office machine on paper. Our review reveals if this is true. According to Acer, the TravelMate P453 range was made for daily use and is suitable for business users as well as demanding private users alike. This impression virtually imposes itself on you when looking at the laptop. The tech specs also let you conclude this. Our test device is powered by Intel's Core i5-3210M dual-core processor. 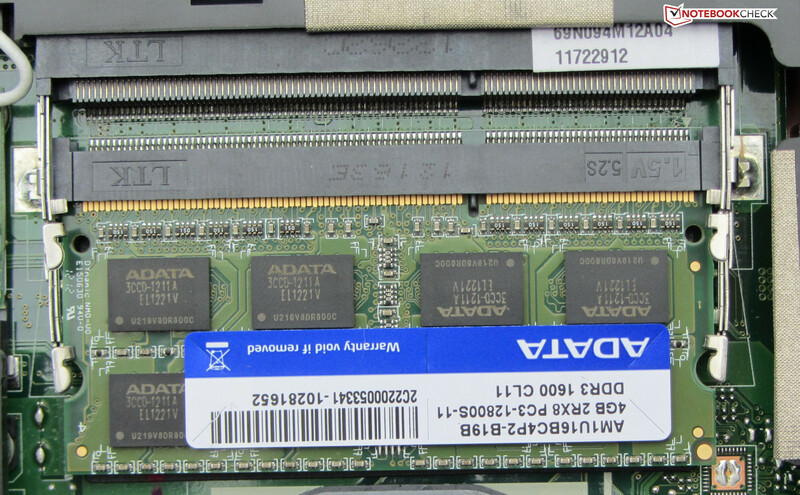 It is supported by 4 GB of working memory. Intel's HD Graphics 4000 GPU takes care of video output. Data and applications are stored on a 500 GB hard disk. This array is complemented by a DVD burner. We use the very similarly equipped Fujitsu LifeBook AH552/SL (Intel Core i5-3210M, Intel HD Graphics 4000), the prior Acer TravelMate 5744-P624G50Mikk (Intel Pentium P6200, Intel Graphics Media Accelerator (GMA) HD graphics) and Lenovo's ThinkPad Edge E535 (AMD A8-4500M, AMD Radeon HD 7640G) to evaluate this laptop. Acer's TravelMate P453 is a member of an almost extinct species: A laptop that does not feature any glossy components whatsoever (including the screen). The entire case features matte black plastic. Merely the lid's back is made of aluminum. No frills or other elaborate ornaments were used. It is obvious that the laptop was made for working. The base unit hardly yields under pressure. Even the area above the optical drive defies pressure quite well. Overall, the casing makes a solid impression. It is possible to warp the lid slightly. The hinges keep the lid firmly in position and are neither pulled too tight nor are they too loose and only allow the lid to rock marginally. It is obvious at first glance: Acer's TravelMate P453 is made for work. The matte surfaces oppose fingerprints quite well. There is a maintenance cover on the bottom. Acer supplies the standard fare in terms of connectivity. All ports needed nowadays are available. An improvement is found when compared with Acer's TravelMate 5744Z. The user does not have to live without HDMI, USB 3.0 and an ExpressCard slot in this laptop. The TravelMate P453's memory card reader has to be highlighted. In addition to the usual SD, MMC, Memory and Memory Stick Pro formats, it also supports the rather unknown SDIO format. SDIO is an extension of the SD standard. It makes it possible to use the card reader for devices other than memory only cards. An example for an SDIO card would be the Eye-Fi memory cards for digital cameras. In addition to the usual memory space, they are also equipped with a Wi-Fi module that can send the taken pictures via WLAN. The SD Association's website has more examples of SDIO cards available. All communication modules in our test device come from Atheros. Acer relies on the model AR8151 as the Gigabit Ethernet chip. 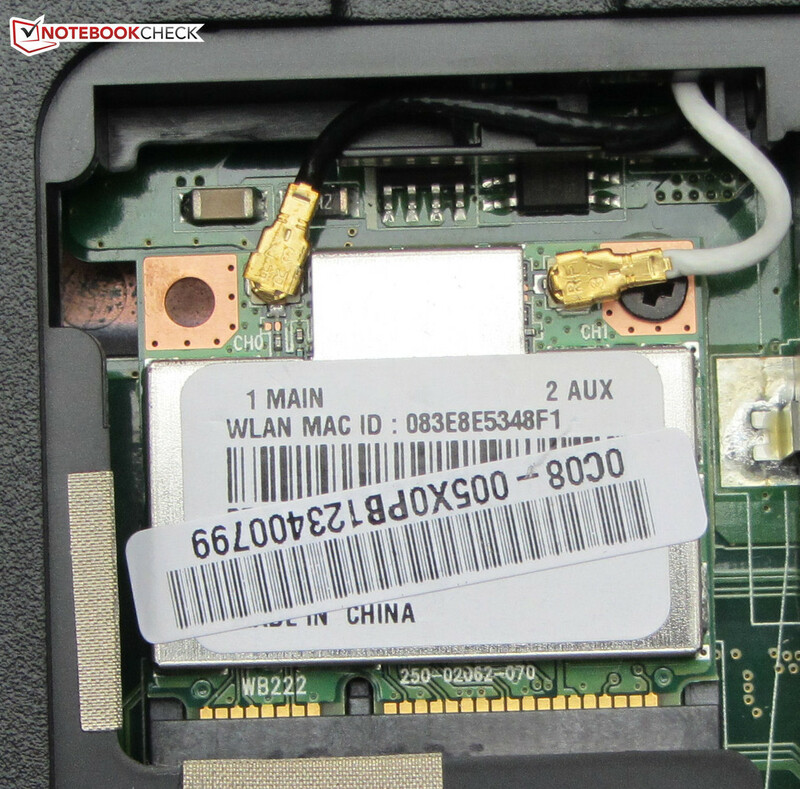 The Wi-Fi module's name is AR5BWB222. It supports the standards 802.11 a/g/n. Even an Atheros Bluetooth chip has found its way into the laptop. It is integrated in the Wi-Fi module and supports Bluetooth 4.0. The laptop features a webcam for making video calls and/or participating in video conferences. The VoIP software Skype is pre-installed. Acer includes the usual laptop accessories: a few quick start guides, warranty and safety notes and a quick start poster. That's all. The laptop is delivered with Windows 7 Professional (64-bit) pre-installed. Since no Windows 7 DVD is included, system recovery requires the use of the included recovery partition. This proves to be very simple because system recovery is launched by using the key combination "Alt" and "F10" right after booting the laptop. This allows the user to restore the laptop to factory settings. It is also possible to cache the user's data. The recovery partition is naturally of no use when the hard disk is to be replaced with another model, such as a solid state drive. In this case, an installation DVD would be necessary for reinstalling Windows 7. One of our news articles (German) reveals how the user can get a Windows 7 DVD - for free. 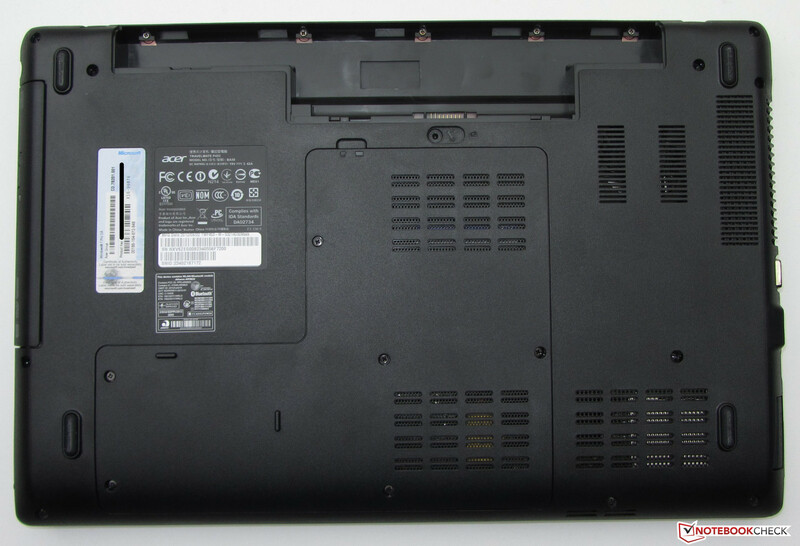 The maintenance cover on the laptop's bottom enables accessing the hard disk, working memory and Wi-Fi module. Acer's laptop sports two RAM banks. Our test device features a four GB module. Thus, the laptop could easily be upgraded to the maximum supported eight GB of RAM. The installed hard disk can easily be replaced by another model without much ado. 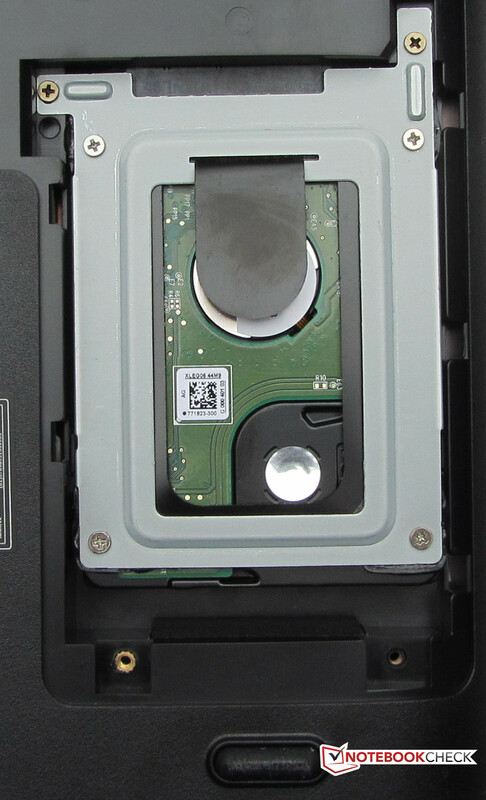 You simply remove the disk, screw the hard drive cage to the new hard disk and insert the hard disk into the laptop. It is not possible to access the laptop's fan. This would be important for removing the accumulated dust between the cooler and heat sink's fins. This dust felts after a while and prevents waste heat from being discharged out of the device. The result: the fan has to work much harder (and thus louder) during use. Acer apparently knows about this problem and tries to prevent dust accumulation with a simple measure. 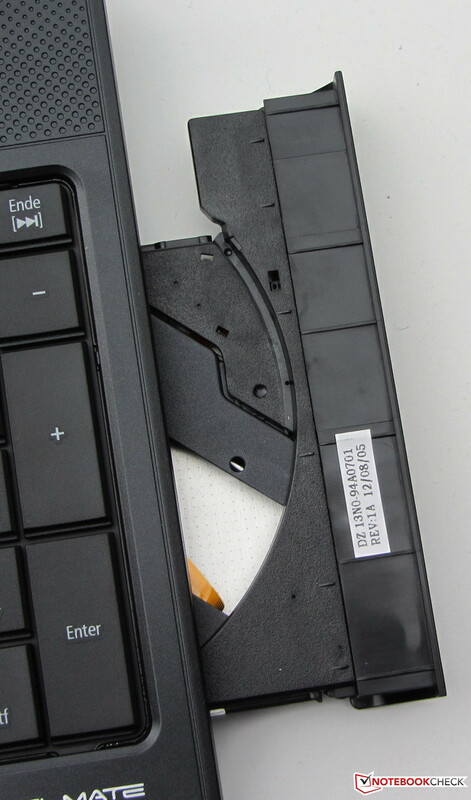 The fan first spins in the opposite direction when the laptop is turned on, which is to blow the dust deposit out of the casing. Whether this method is successful will be seen in the course of time. 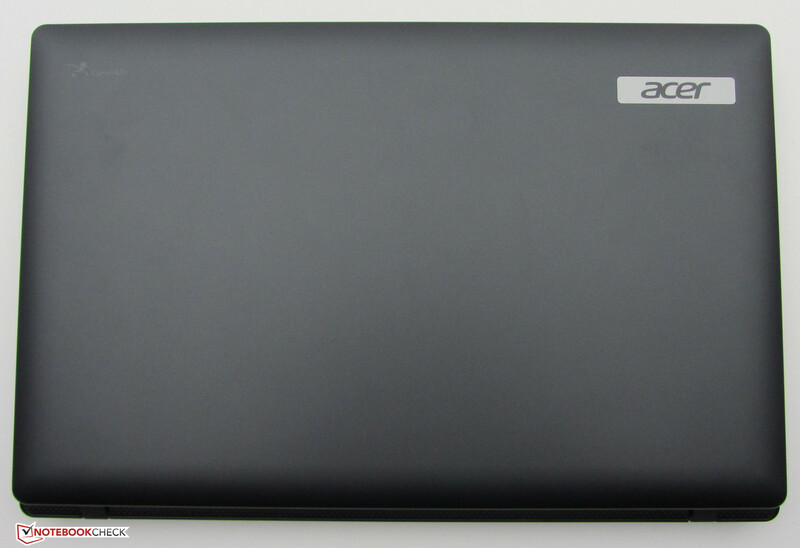 Acer's TravelMate P453 includes a 24-month pick-up & return warranty, so Acer picks up the device from the customer. This standard warranty can be extended. A warranty extension to 3 years costs approximately 60 Euros (~$77) and must be bought and activated within the first 90 days of purchase. Acer equips the TravelMate P453 with a conventional keyboard. The main keys feature a size of 16 x 16 mm (~0.63 inches), a medium key drop and clearly palpable stop. However, the keys are a bit too sensitive. Acer's keyboard cannot compete with the good keyboard in Lenovo's ThinkPad Edge E535. It does not feature a backlight. Acer makes the keyboard spill-proof by installing ducts which are to protect the innards against accidentally spilled liquids. The mouse replacement is an 8.6 x 4.5 cm (3.4 x 1.8 inch) touchpad. It's slightly roughened surface does not hinder the finger in gliding. However, the touchpad could have been a bit bigger especially since the right edge serves as a scroll field and is consequently not available for moving the cursor. This lessens the usable surface even more. 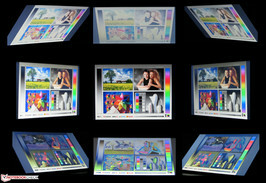 The pad is multitouch capable and supports features such as pinch-to-zoom. Acer installs a matte 15.6-inch screen into its P453 featuring a native resolution of 1366x768 pixels. The screen is illuminated by LEDs. Screens with other features are not available for the TravelMate P453. This is too bad because a screen with a resolution of 1600x900 pixels would look good in this laptop. The screen's average brightness of 220 cd/m2 is in the upper midfield. Fujitsu's LifeBook AH552/SL is slightly lower with 206.2 cd/m2 and Lenovo's ThinkPad Edge E535 clearly surpasses both other laptops with an average brightness of 259 cd/m2. The black value of 1.43 cd/m2 is only in the lower midfield. 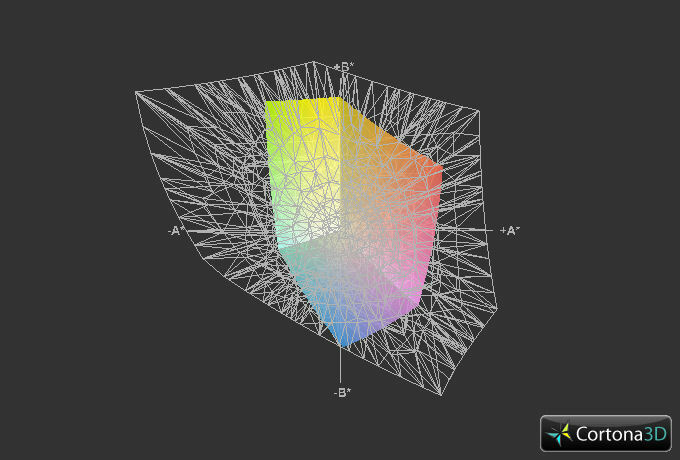 The same is true for the contrast ratio of 159:1. Both rates could be better. Lenovo's ThinkPad Edge E535 supplies much worse rates with a black value of 2.24 cd/m2 and a contrast of 123:1. Although Fujitsu's LifeBook AH552/SL exhibits better rates (1.19 cd/m2 / 179:1) than its contenders, they are not awe-inspiring in total. 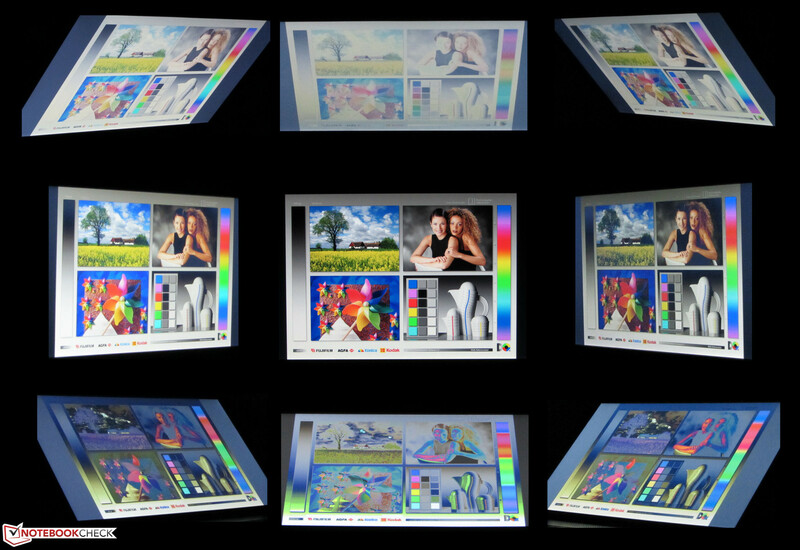 The TravelMate P453 reproduces neither the sRGB nor AdobeRGB color spectrum. 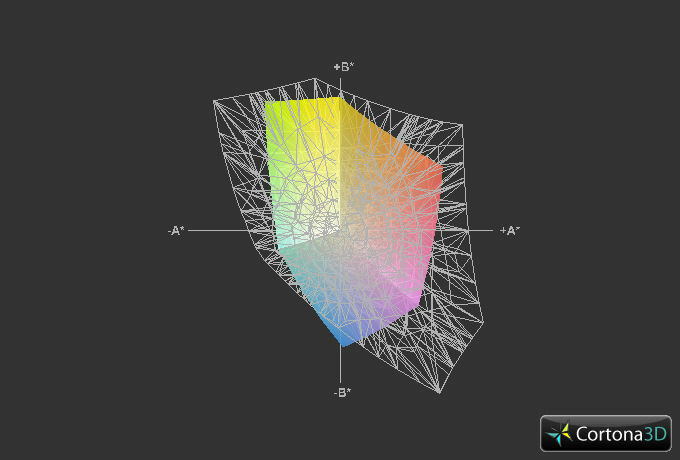 However, this is not a problem since these color spaces are only required in the professional picture and graphics field. The screen's brightness is sufficient for outdoor use. The matte surface prevents annoying reflections. Nevertheless, direct sunlight should be avoided. The viewing angle stability of Acer's TravelMate P453 is no surprise and fulfills our expectations. Image distortions occur quickly on the vertical plane. The horizontal viewing angle is not as susceptible and the image remains stable over the entire angle. However, the brightness diminishes a bit. Acer's TravelMate P453-M-53214G50Maak is an office laptop. Its equipment is suitable for common applications such as Internet browsing, emails, VoIP, rendering DVDs or word processing. It is even possible to play games on the laptop - although only to a certain extent. At the time of our review, a second model from the TravelMate P453 range was available. The roughly 100 Euros (~$129) more expensive TravelMate P453-MG-53214G50Makk is identical with the laptop we are testing here. However, it features NVIDIA's GeForce GT 640M GPU. If you are looking for a downright business laptop, you should look closer at Acer's TravelMate P653 (Intel Core i5-3210M, NVIDIA GeForce GT 640M). 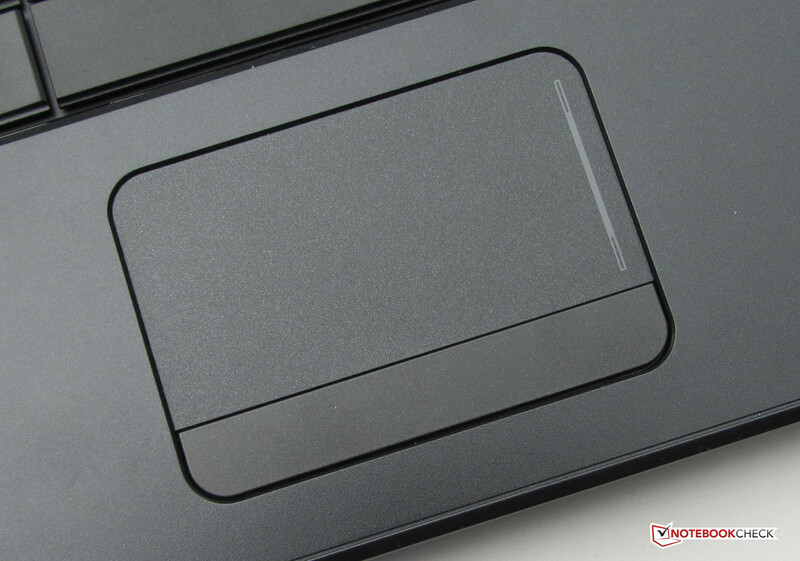 It sports a docking port, a better keyboard, more interfaces, a fingerprint reader and TPM. It costs approximately 800 Euros (~$1030). Acer equips its TravelMate P453 with Intel's Core i5-3210M dual-core processor from the Ivy Bridge processor generation. The CPU's clock speed is 2.5 GHz. The clock can be increased to 2.9 GHz for both cores and 3.1 GHz for one core (Intel's Turbo Boost). The CPU cores are accelerated automatically. In AC-mode, both cores operated with full speed (2.9 GHz) during our full load test (Prime95 and FurMark run simultaneously). The GPU also clocked to its limit of 1100 MHz. This behavior does not change on battery. The CPU also finished the Cinebench tests with its full clock. The results are on a par with other laptops featuring Intel's Core i5-3210M processor, e.g. Fujitsu's LifeBook AH552/SL or even Apple's MacBook Pro 13 (Mid 2012). It is not surprising that Acer's TravelMate 5744Z (Intel Pentium P6200, Intel HD Graphics) is clearly defeated by the TravelMate 453 in every test. Lenovo's ThinkPad Edge E535 (AMD A8-4500M, AMD Radeon HD 7640G) cannot keep up with the TravelMate P453 in Cinebench's CPU benchmark tests. The CPU part of AMD's A8-4500M APU's is clearly inferior to the CPU part of Intel's Core i5-3210M processor. Surprisingly, the laptop is also inferior in Cinebench 10's GL tests. However, Lenovo's ThinkPad Edge E535 clearly wins in Cinebench R11.5's GL benchmark test. Cinebench R11.5 GL test is considerably GPU-heavier than Cinebench 10's GL test. This explains the different results. AMD's Radeon HD 7640G GPU can first exhibit its strengths in Cinebench R11.5. The routine work speed is satisfactory. The system runs smoothly. The PCMark benchmark scores are on the expected level and thus in the field of other laptops sporting similar equipment. Fujitsu's LifeBook AH552/SL (Intel Core i5-3210M, Intel HD Graphics 4000) only stands a chance against Acer's TravelMate P453in PCMark 7. It reaped in a considerably lower score in PCMark Vantage. Lenovo's ThinkPad Edge E535 cannot keep up with the contending devices in neither PCMark benchmarks. 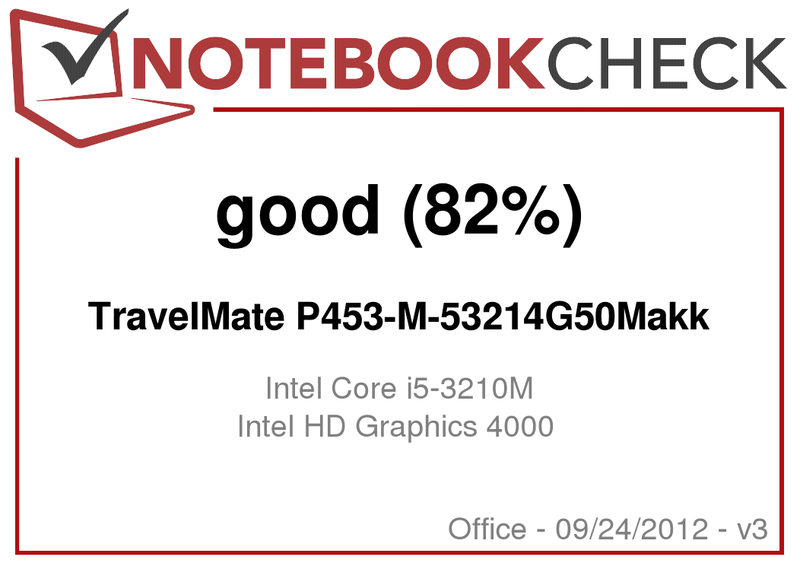 Acer's TravelMate 5744Z (Intel Pentium P6200, Intel HD Graphics) is also clearly defeated by the TravelMate P453 in the PCMark tests. Acer equips the TravelMate P453 with a hard disk from Western Digital's Scorpio Blue series. The hard disk features a storage capacity of 500 GB and works with a speed of 5400 revolutions per minute. The average transfer rate of 76.9 MB/s is in the upper midfield for 5400 rpm disks. The access time of 16.3 seconds is also in the upper midfield. A motion sensor protects the laptop's user from data loss. As soon as the sensor detects shocks, the hard disk is prompted to park the read/write head. This is to prevent damage to the hard disk and consequently loss of data stored on it. Acer designed the TravelMate P453 as an office machine. Therefore we would have expected that focus is placed on the hard disk's speed and not on the largest possible storage capacity. A 7200 rpm hard disk, if not a low-capacity solid state drive, would have been perfect for the laptop and even let it stand out from the competition. Intel's integrated HD Graphics 4000 GPU takes care of video output. The DirectX 11 capable graphics chip operates with a speed between 350 and 1100 MHz. This GPU is Intel's latest top model and is appropriately well-equipped. The GPU runs persistently with its maximum speed of 1100 MHz during our full load test (Prime95 and FurMark run simultaneously). The results are thus on the expected level of similar laptops, such as Fujitsu's LifeBook AH552/SL (Intel Core i5-3210M, Intel HD Graphics 4000). 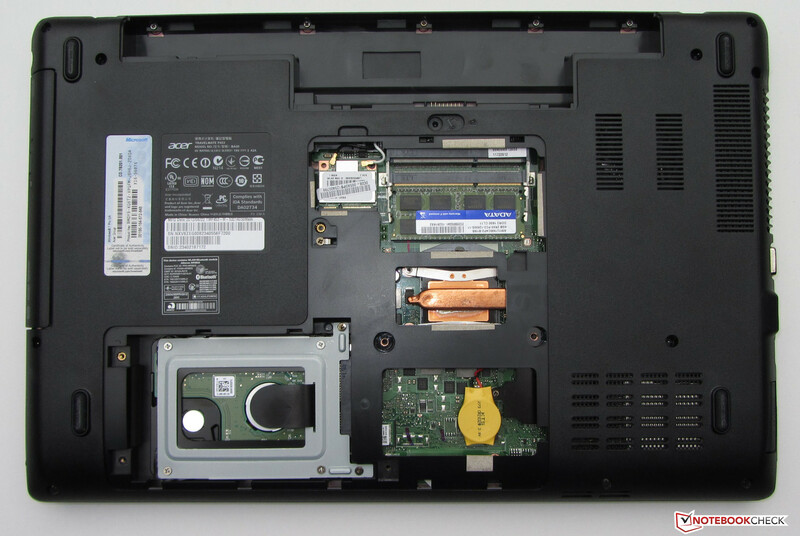 Lenovo's ThinkPad Edge E535 (AMD A8-4500M, AMD Radeon HD 7640G) clearly defeats both laptops. The integrated Radeon HD 7640G GPU bids more power than Intel's GPU. Acer's TravelMate 5744Z-P624G50Mikk (Intel Pentium P6200, Intel HD Graphics) again lags clearly behind the TravelMate P453 in this case. 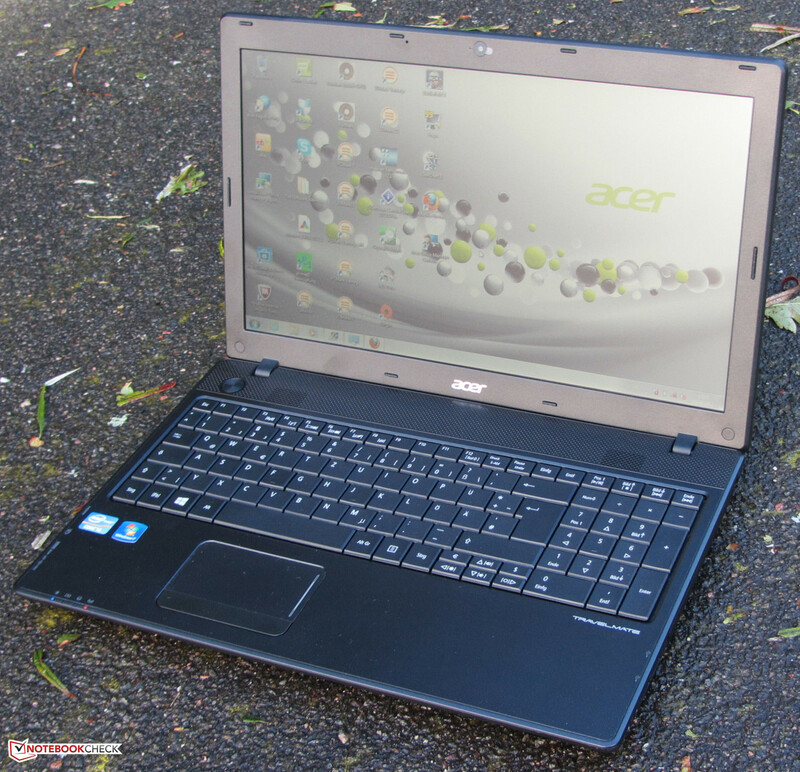 Acer's TravelMate P453 is an office laptop and thus its gaming performance is only secondary. The test results reflect this. The games we tested could be played smoothly in a low resolution as well as low quality settings - except for Battlefield 3. Stutters occur in higher resolutions and/or quality settings. If you would like to play computer games on a regular basis, you should look closer at Acer's TravelMate P453-MG-53214G50Makk. It is identical to the TravelMate P453-M-53214G50Maak, but sports NVIDIA's GeForce GT 640M GPU. Acer's TravelMate P453 generally runs quietly. Its noise ranges between 32.4 and 33.2 dB(A) when idling although the fan runs permanently. The noise increases to 35.4 dB(A) when the DVD drive is used. Even during full load (Prime95 and FurMark run simultaneously), the noise level of 39.2 dB(A) is still acceptable. Fujitsu's LifeBook AH552/SL is only on a par with the TravelMate P453 when idle. It produces a lot more noise during load. Lenovo's ThinkPad Edge E535 generates much less noise than either contender over the entire load range. We recorded acceptable temperatures throughout for the TravelMate P453 while idling. The laptop reached temperatures between 25 and 33 degrees Celsius on both its top and bottom. The temperatures only increased moderately to rates between 26 and 34 degrees Celsius during load. Thus, the laptop allows working pleasantly in every state and it can be placed on the lap without hesitation. Both CPU cores persistently operated at full speed (2.9 GHz) during our stress test (Prime95 and FurMark run for at least one hour). The same was true for the GPU. We also observed this behavior on battery power. Ergo, throttling did not occur. The temperatures settled to approximately sixty degrees Celsius. (+) In idle usage, the average temperature for the upper side is 27.6 °C / 82 F, compared to the device average of 29.4 °C / 85 F.
The laptop's two speakers are located above the keyboard. The sound is appropriate for an office machine. As in many other laptop speakers, there is no bass. The speakers tend to sound a bit tinny. If you do not like the sound, it is always possible to connect external speakers or headphones to the laptop. Compared with other identically equipped laptops, Acer's TravelMate P453 is quite energy efficient. 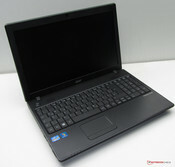 Its power consumption is even lower than that of the weaker performing Acer TravelMate 5744Z-P624G50Mikk. We measured a power consumption between 6.9 and 10.4 Watts at idle. 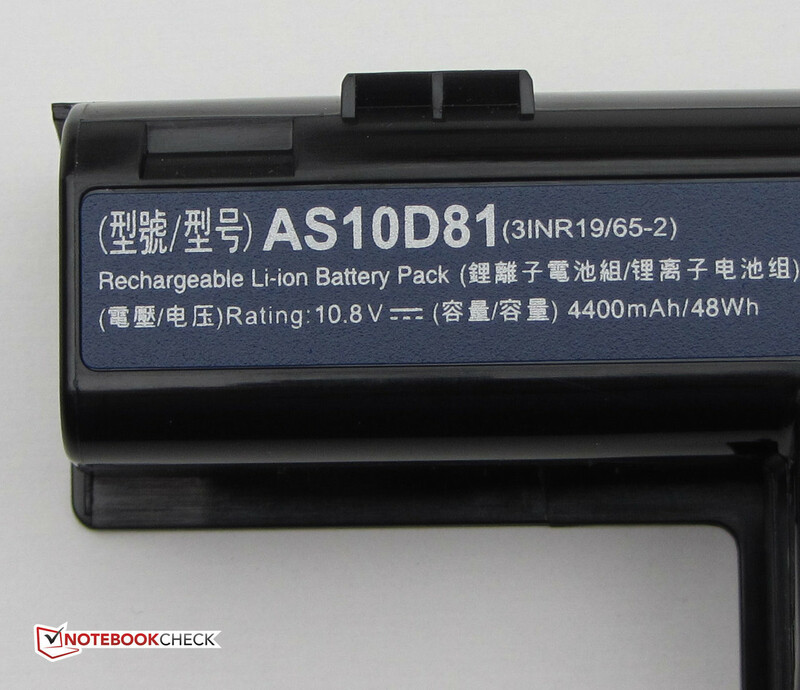 Thus, the rates are lower than the similarly equipped Fujitsu LifeBook AH552/SL (8.8 to 10.9 Watts). 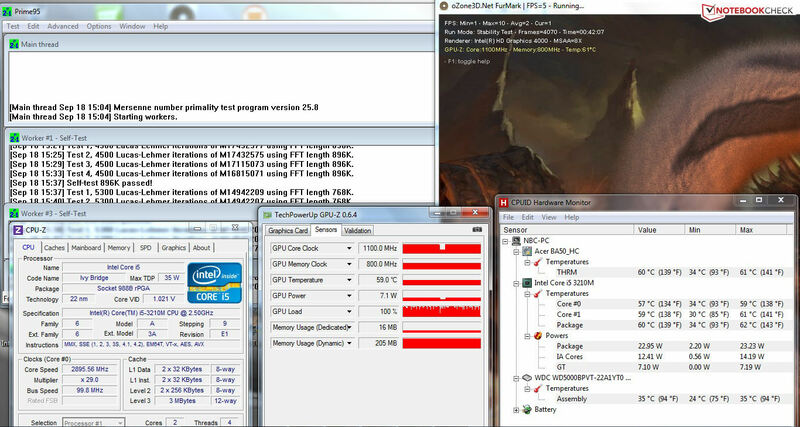 We recorded a power consumption of 41.2 Watts during full load (Prime95 and FurMark run simultaneously). The TravelMate P453's consumption is 9.2 Watts lower than that of Fujitsu's LifeBook (50.4 Watts). The TravelMate P453 consumption of 32.5 Watts is exactly 6 Watts less than Fujitsu's LifeBook (38.5 Watts) in the medium load range (3DMark 06). Overall, Acer's TravelMate P453 consumes much less power than Fujitsu's LifeBook AH552/SL throughout the entire load range. Lenovo's ThinkPad Edge E535 is on a par with Fujitsu's LifeBook in terms of power consumption and thus consumes more than Acer's TravelMate P453. The TravelMate P453 managed an idle runtime of 8:27 h. Fujitsu's LifeBook AH552/SL only achieves 7:15h, whereby Lenovo's ThinkPad Edge E535 can compete with Acer's laptop (8:26h). Acer's TravelMate 5744Z lags far behind the other laptops with a runtime of 4:52h. We determine the maximum runtime using the Battery Eater Reader's test. The screen is set to minimum brightness, the energy-savings profile is enabled and the wireless modules (Wi-Fi, Bluetooth) are disabled. The TravelMate P453 lasted for 1:28h in this load condition (AH552/SL: 1:09h; Edge E535: 1:31h; 5744Z: 1:26h). We determine the minimum battery runtime by using Battery Eater's Classic test. Here, we set the screen to maximum brightness and enable the high-performance profile and wireless modules. The completely charged battery kept the Wi-Fi test going for 5:21h (AH552/SL: 4:15h; Edge E535: 4:48h; 5744Z: 1:59h). Websites are automatically opened every 40 seconds via a script in this test. Energy-saving mode is enabled and the screen's brightness is set to approximately 150 cd/m2. The TravelMate P453 achieves a runtime of 4:22h in the DVD test (AH552/SL: 3:36h; Edge E535: 4:48h; 5744Z: 1:47h). That is just long enough for watching two movies. The wireless modules are disabled and the screen is set to maximum brightness for the DVD test. We use the energy-saving profile or a higher profile (should the DVD not be rendered smoothly) in this test. The battery life of the four laptops can be compared well with each other since they all use a 48 Wh battery. It is interesting how much more runtime Acer can wring out of a virtually identical laptop in contrast to Fujitsu's LifeBook AH552/SL. Lenovo's ThinkPad Edge E535 can compete with the TravelMate P453 in both load and idle conditions. However, it does not achieve Acer's runtime in the Wi-Fi or DVD test. Acer's TravelMate 5744Z lags behind the TravelMate P453 and only supplies half the battery runtime with exception of the load test. 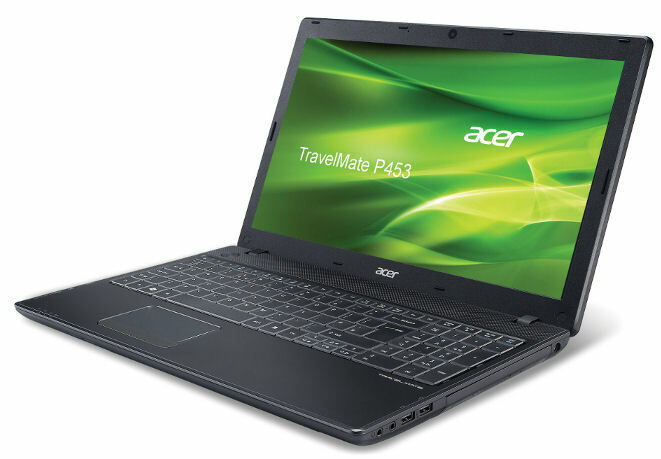 Acer supplies a good office laptop with its TravelMate P453-M-53214G50Maak. The laptop features a matte, solid casing as well as a matte screen. 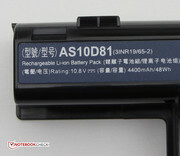 The power consumption is compelling and the resulting battery runtime is also very good. Moreover, the laptop runs quietly most of the time. However, Acer does not hit a home run with the laptop. Like so many other laptops, the TravelMate P453 only has a moderate, contrast-poor screen. If you put value on a significantly better screen, you will have to dig deeper into your pocket and for example invest in Fujitsu's LifeBook E782 or HP's ProBook 6560b. Acer also waives on a faster hard disk in favor of a hard disk with a higher memory capacity. If you can accept these restrictions, you will get a laptop that can cope with common application scenarios. If you were playing with the thought of buying Lenovo's ThinkPad Edge E535, the TravelMate P453 may be an option. Overall, both devices are mostly on a par. The biggest difference is found in the CPU and GPU performance. The TravelMate P453 offers a better CPU performance while Lenovo's ThinkPad Edge E535 provides more GPU power. The DVD drive reads and writes every kind of DVD or CD. 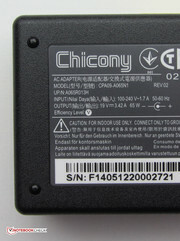 ...and supplies a capacity of 48 Wh. you can take out the DVD burner. 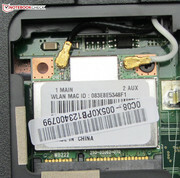 The Wi-Fi module is also accessible. The hard disk can be replaced quickly. 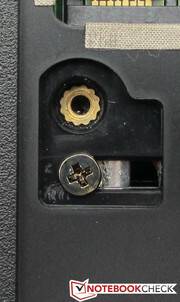 Several screws secure the maintenance cover. The matte casing and matte screen; the low power consumption; the battery life. A better, higher contrast screen. Acer wrings out a lot more battery runtime from Intel's platform than the competition from its identical laptops.